A cordless drill is an essential tool for professionals and do-it-yourselfers alike, due to its versatility in tackling a wide variety of applications. Simply put, you can use it to drive screws or drill holes with ease, making it a must-have tool for anyone who performs those tasks on a regular basis. The motor on the DeWalt DCD771C2 has a power output of 300 UWO (unit watts out). Unit watts out is a power rating that describes the point where torque and speed are highest. The higher the unit watts out, the better for you and your time efficiency. The drill’s dimensions are 13.9 x 9.9 x 4.2 inches and it weighs 3.6 pounds, making it a compact drill that’s small enough to fit into the tight spaces you’re likely to be working in. A lightweight, hand-operated piece of equipment that’s often used at awkward angles is the perfect recipe for pain and tension. 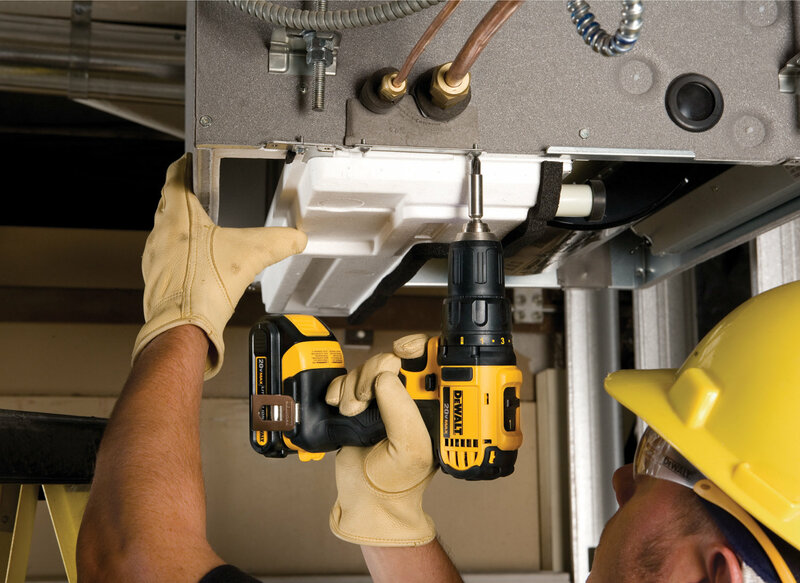 Luckily, the DeWalt DCD771C2 features an ergonomic handle that prevents strain on your hands, wrists and arm. This keeps you pain free while you work and also aids in maneuverability and control, so you feel not only comfortable but confident during use. The two-speed transmission on the DeWalt DCD771C2 yields two speed ranges: 0-450rpm and 1,500rpm at low and high speed, respectively. Not only does this allow for versatility in drilling applications, the 1,500rpm speed combines with high torque to give the awesome 300 UWO power rating this drill has. The DeWalt DCD771C2 cordless drill is powered by two rechargeable 20V lithium-ion batteries, so you get enduring power without having to worry about fade. The drill also comes with a contractor bag. Some people have complained that the chuck doesn’t hold the bits, though most people haven’t had this problem. Due to few having this issue, it’s likely a defect in a minority of the drills sold or it’s a user error where the users have used the wrong bit size or type into the chuck. 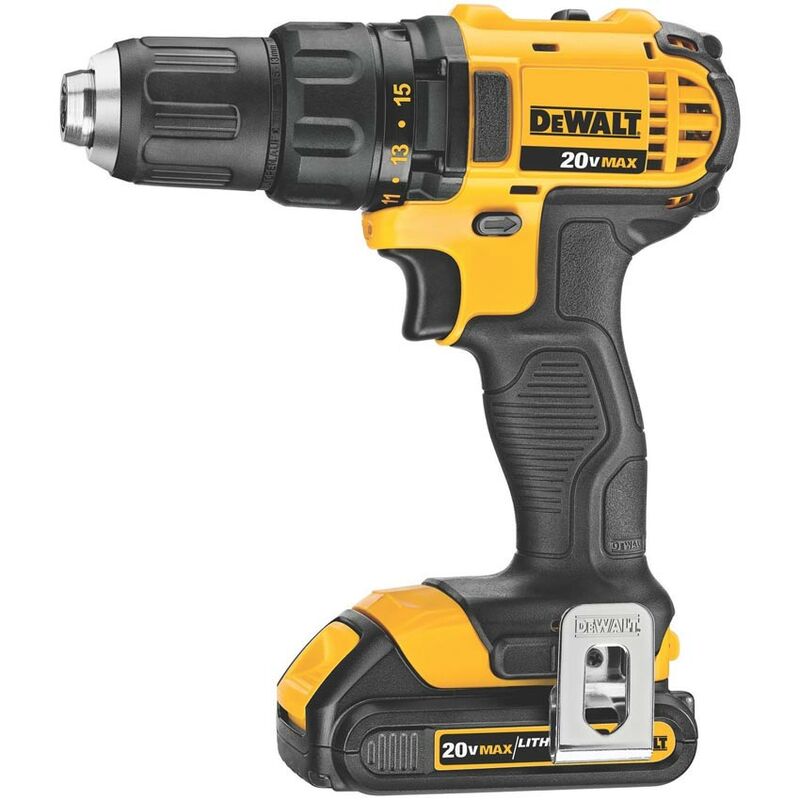 I’d recommend the DeWalt DCD771C2 to anyone looking for a sturdy, capable and comfortable drill that stands the test of time while doing the job it’s meant to do. Because of its 300 UWO, it really gets the job done quick, which is a bonus when efficiency is key. If you in the market for a new drill, reliability, comfort and power are paramount. The new Dewalt DCD780C2 20V cordless drill has these attributes in spades. The DCD780C2 features advanced electronics that help provide maximum life by safeguarding against overheating and overloading during prolonged use. The unit features a 20-volt lithium/ion battery that provides more runtime. Additionally, the DCD780C2 possesses a high-efficiency motor that can produce 350 unit watts of sustainable power. The Dewalt DCD780C2 design features a slimmer handle and an ergonomic contoured grip that provides users the comfort they need when performing extended jobs. Weighing in at 3.4 pounds and measuring 7.5 inches in length, the drill is also smaller than other cordless drills on the market. The DCD780C2 from Dewalt features great accessories that make its’ use easier for the do-it-yourself person in your household. The drill comes with both belt hook and bit holder that are installed on either side of the tool just above the battery. If you purchase the kit version, it includes both a battery charger and two 1.5Ah compact 20V batteries. You also have the option of purchasing a multi-battery charger as an accessory. Extremely lightweight and compact compared to other cordless drills on the market. Extremely powerful and less susceptible to motor failure and overheating. While the LED display is bright, it’s positioning on the drill can make it hard to see for some users. The DCD780C2 is mostly made of plastic and could be vulnerable to damage with long-term heavy use. The Dewalt DCD780C2 is an excellent choice in cordless drill for those who perform light to medium scale projects that you may have around your home. If you are new to the world of cordless drills and looking for a first drill that combines power with comfort, the DCD780C2 should be at the top of your list. With its 20 V battery, you are able to tackle multiple projects around the house and have both power and battery life to spare. The Dewalt name is synonymous with both quality and versatility, and the DCD780C2 has these attributes in spades. With its compact size, power, and comfort the Dewalt DCD780C2 will be a constant presence on your toolbelt. Best of all, the Dewalt DCD780C2 is easy on the pocketbook and its solid construction means that you will get years of service for your investment. Purchase the DCD780C2 right now!